A full administrator can restrict the rights of other administrators (full and domain administrators) such that they will not be able to modify certain properties. Some examples which come to mind are: type of accounts that can be managed, number of accounts which can be created by the domain administrator, daily send out limit for the users or the maximum message size. This is the recommended way of managing administrators' rights starting with version 11.3 of IceWarp Server. This file contains serialized permissions object in XML format. This file can be used to define the access rights for full administrators and domain administrators. A full administrator should create a file adminperm.dat in the root folder of the administrator account to be managed. If the file adminperm.dat does not exist in the root folder of an administrator, a full administrator has all the rights on all the domains and all the accounts, a domain administrator has all the rights on his own domain and the accounts therein. Structure of the file adminperm.dat : It contains two tags: <domainspermissions> and <globalpermissions>. 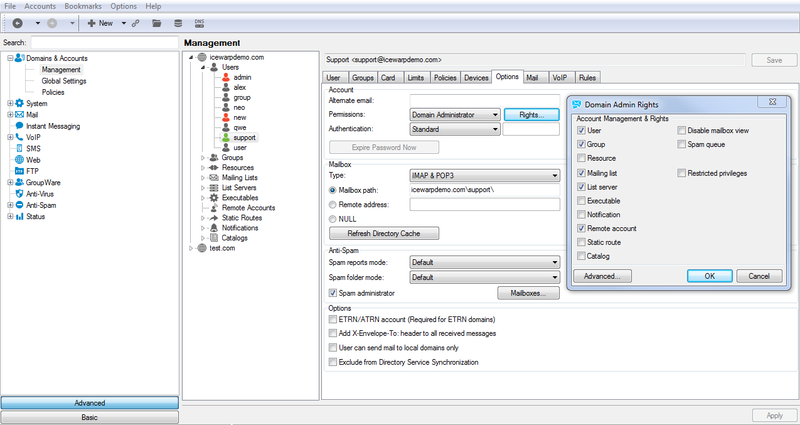 <domainspermissions> defines the permissions for domains and accounts. Each item consists of <domainsset> and<domainsadministrativepermissions>. It is now possible to define for the same administrator (full or domain) different rights for the domains he is allowed to manage. <domainsset> contains the list of domains that administrator is able to manage. Each item consists of a domain mask and a negate parameter. The mask should contain a domain name. Wildcards * and ? are accepted. The parameter <negate> when set to 1 implies that the particular domain is explicitly removed from the list of managed domains of this this administrator. Example bellow has new tags, such <prop> and <perm>. The variable (<prop>) indicates the variables from apiconst.pas (IceWarp\api\delphi\apiconst.pas). 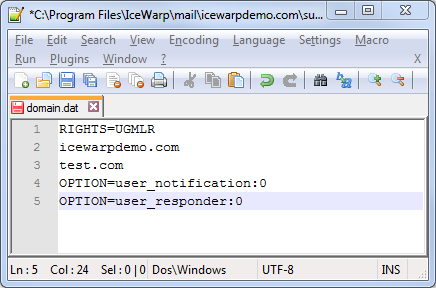 Notice, the example bellow has syntax, which will be suitable for IceWarp version starting from 11.3.1. 2 – full rights (read, write). If you still did not update your IceWarp server, and current version is 11.3.0 you need to use tag <prop> in different way. API variables in apiconst.pas file are also divided on 3 groups: variables that are related to full administrator, domain administrator and user configuration. The variables that are starting with letter C_ - are related to configuration of global permissions, e.g. server system configurations (will be described in few strings later). Starting with D_ indicates the variables, what will be applied to configuration of domain only, what was stated in <domainset>. And variables starting with U_ are related to configuration of accounts. The tag <globalpermission> is used to describe global server properties. This feature is should be applied to administrator with full rights. For example main administrator would like to restrict the right of another full administrator ability to change the language of server (server language is used for localization of general messages, like conference info). The above example restrict to full administrator to see the date, install path and the license of the server, as you can see in tag <perm> the value is 0, what mean no rights. The variable C_System_Server_language has permission 1 in tag <perm>, what mean Read only, this feature will be available for administrator in API console from Web-Admin, but he will have no access to write. The administration console of the version 11.3 still offers the GUI to manage the domain administrator's rights. This method of managing access rights is deprecated starting with version 11.3 of IceWarp Server and the usage of adminperm.dat is strongly recommended. The basic structure of the file domain.dat is presented here because the new WebAdmin still respects part of this file as explained below. Go to server administrative console – <user> – Options tab – Permissions (– Domain Administrator) – Rights button. The Domain Admin Rights dialog opens. Select the categories the domain administrator is allowed to manage. Out of these three directive types, only the first two types (RIGHTS and list of managed domains) are still respected by the new WebAdmin. If a right or a domain is not specified in the file adminperm.dat (current way of managing rights), it is read from the file domain.dat (old way of managing rights). We strongly recommend all administrators to use only the file adminperm.dat.